In 2015, the Narendra Modi style was the talk of the fashion world. Since his rise to the hot seat of India’s Prime Minister, Narendra Modi has made headlines for not only diplomacy, controversies and foreign trips but also his traditional Indian fashion. Over 40 African leaders donned signature “Modi Kurtas” in silk and “Modi Jackets” in khadi for a dinner at the third India-Africa summit in New Delhi. In 2016, the Narendra Modi fashion will be put on display at Madame Tussauds Wax Museums in London, Singapore, Bangkok and Hong Kong. Who will be exhibiting the “Modi Kurtas” and “Modi Jackets” at those wax museums? The wax statues of Indian PM Narendra Modi himself! Since being elected to the prime ministerial office in 2014, Narendra Modi has made foreign trips to the US, the UK, the UAE, China, Canada, Singapore, Japan, France, Brazil, Germany, Malaysia and other countries. Now his traditional Indian fashion in khadi will be stealing the show at Madame Tussauds wax museums. What made Madame Tussauds to spend a lavish amount of $214K for each of his wax figures? In response to the mounting curiosity and excitement about it, Madame Tussauds described Narendra Modi as “a hugely important figure in world politics” and said that visitors would be glad to click selfies with the wax idols of such a great leader. Besides, PM Modi is currently the second most followed politician on Twitter next to the US President Barack Obama. 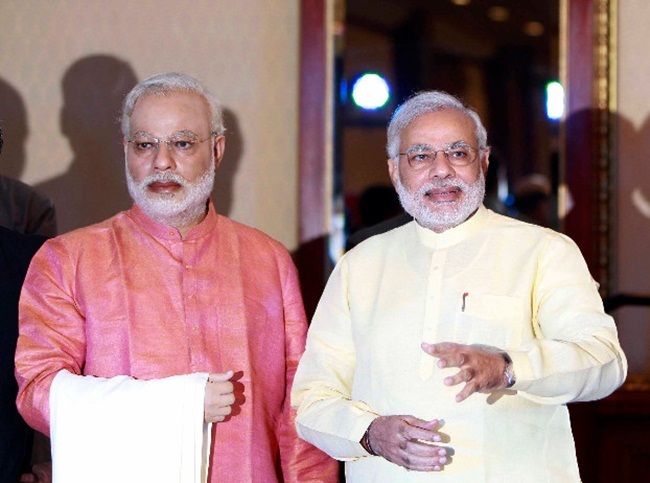 Where and when were the wax figures of Narendra Modi crafted? It happened at his own residence in New Delhi where he gave the museum team of artists and experts a sitting, according Kieran Lancini, the spokesperson of Madame Tussauds. Praising the team for its dedication and professionalism, the Indian Prime Minister said that he had the pleasure of standing next to the figures of various dignitaries for photographs during my visits to Madame Tussauds’ wax museums. There is nothing surprising about the wax statues of Indian PM Narendra Modi at Madame Tussauds museums in Singapore, London, Thailand and Bangkok since he is among the most influential people on Internet. Time Magazine refers to him as an ‘Internet Star’ with over 32 million Facebook likes and 18 million Twitter followers. PM Modi has been on Time Magazine’s list of the most influential people on Internet for two consecutive years: 2015 and 2016. When are you flying to London or Singapore or Bangkok or Hong Kong to click selfies with wax statues of Indian PM Narendra Modi?